Abu Dhabi isn’t exactly Willmar, Minnesota. Neither is Oxford for that matter. But for Julie Retrum, it’s similar enough. The instructor in geology and geological engineering, who hails from the small, south central Minnesota town of Willmar, lived and worked in the United Arab Emirates for three-and-a-half years before accepting her position at the University of Mississippi in spring 2017. She expressed her appreciation for her time abroad but also for being back in the United States and at the university. Retrum moved to Abu Dhabi, the capital of UAE, in 2014 to work at a university there with a good friend and colleague. They had written a research grant proposal that received funding to study climate change using corals. A carbonate geochemist, Retrum is studying how tropical systems contribute to, adapt to and facilitate global climate change. 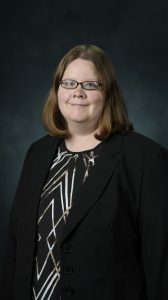 Her current research projects focus on reconstructing paleoclimate (a past climate of an area during a given period of time in its history) and paleoenvironmental (a past environment of an area during a given period of time in its history) records from stalagmites and corals in the Middle East. That work is important, she said, because so few paleoclimate records are from this region. The Arabian Desert in the UAE today, for example, is semi-arid to arid (climate) and mostly a desert environment. In the Late Miocene (6-8 million years ago), the area still would have been semi-arid but would have received more precipitation to sustain rivers, grasslands and trees in a savanna environment. Retrum’s research interests include tropical Quaternary (a historic period spanning from 2.6 million years ago to the present) paleoclimate reconstructions, low-temperature geochemistry and geochronology. Until the end of the 20th century, the tropics were thought to be relatively static during small climatic change events. Recent tropical paleoclimate records exhibited both large- and small-scale climatic events, but the dearth of studies and data in the tropics hinders understanding of atmospheric and oceanic interactions among low, mid and high latitudes. Retrum is a welcome and valuable asset to the GE department, said Gregg Davidson, chair and professor of geology and geological engineering. Retrum said she has found her colleagues in the department and the School of Engineering have been very welcoming and helpful during her first few semesters. Retrum is working on short- and long-term goals for herself, both as an instructor and as a researcher. For example, Retrum said she wants her Environmental Geology Hazards students to leave her class knowing what to ask when buying their first house to avoid any potential hazards that could affect the house. “And, of course, I want to get some of the nonmajor students to switch majors to geology and geological engineering,” she added. As a researcher, Retrum’s goals are to continue working on Persian Gulf and Gulf of Oman corals to reconstruct climate records from the Middle East. Retrum earned her bachelor’s degrees in geology, biology and statistics from the University of Minnesota-Morris. She also earned master‘s and doctoral degrees in geology from the University of Kansas. She said receiving a National Science Foundation Postdoctoral Fellowship in 2010 is her most fulfilling professional achievement to date. “This prestigious award is only given to a few people a year and allowed me to choose my postdoctoral research project and work with one of the top paleoclimate geochemists and laboratories in the country,” she said. Willmar, home to Jennie-O Turkey, and Oxford are similar in size and population, Retrum said. However, Willmar is mostly a farming community and has many lakes. As for her family, Retrum’s retired parents and a brother still live hundreds of miles away in Minnesota. In Oxford, Retrum said she enjoys gardening, reading, hiking, traveling and spending time with Fireball and Cricket, her two cats.